Green Mountain near North Bend has been an off-season favorite. 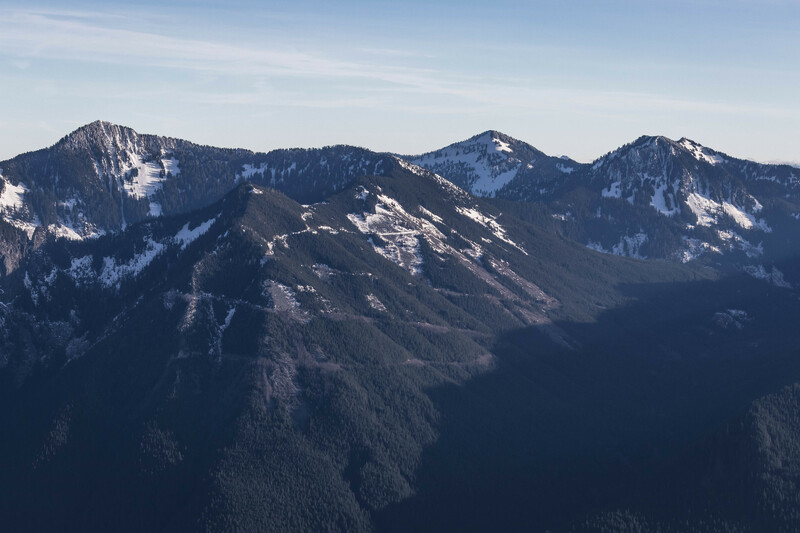 Of the 11 Green Mountains in Washington State, we’ve only climbed three so far. Due to time constraints, today we paid another visit for a better shot at solitude. 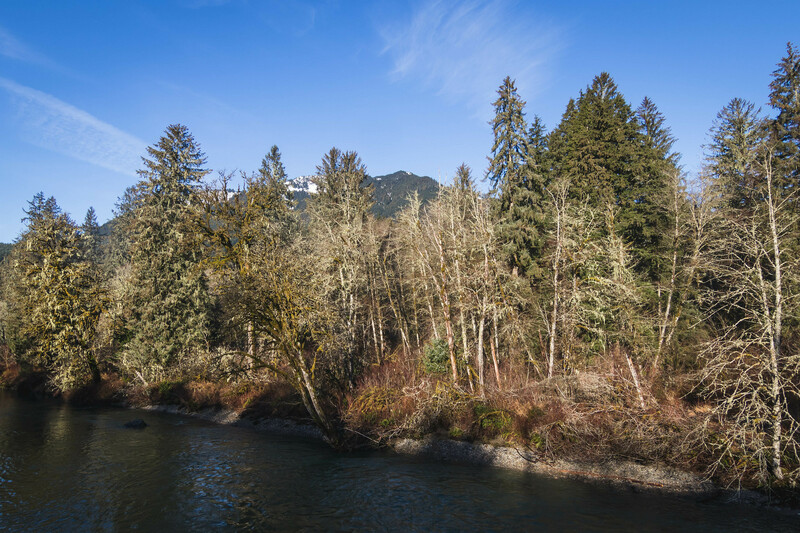 I parked on the south end of the Middle Fork Snoqualmie River bridge and walked across the bridge. From the inconspicuous trail on the north end of the bridge, we immediately dropped down to the forest floor. The muddy trail wound its way through the luscious forest as we passed by several large spruce trees. We quickly reached the CCC road after getting over a minor ridge. The trail continued on the other side of the road, and we soon reached the Green Mountain Road. Spotty views to the east began to appear as we slowly gained elevation. Eventually, we came out onto the Last Chance Promontory after making five switchbacks on the road. We took a break to enjoy the expansive view of the valley. So far for all of our visits to Green Mountain, we had taken the southeast ridge by the promontory. 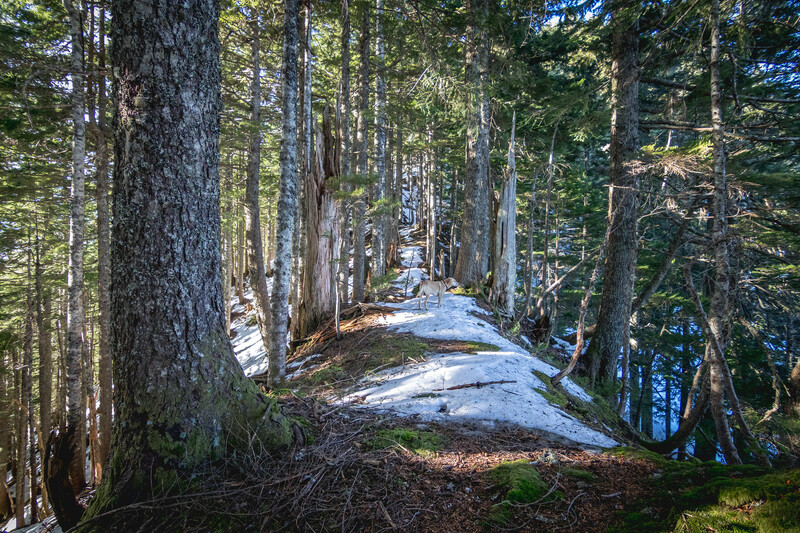 Another option would be to continue hiking on Green Mountain Road through several gullies and head up the east ridge. Once on the saddle between the main and the north summits, travel south to finish the climb. The third option would be making a left at the junction 1000′ before the promontory and following the road to its end. Judging from one party’s GPS track, they eventually came out onto the saddle between the main and the middle summits to finish the climb. 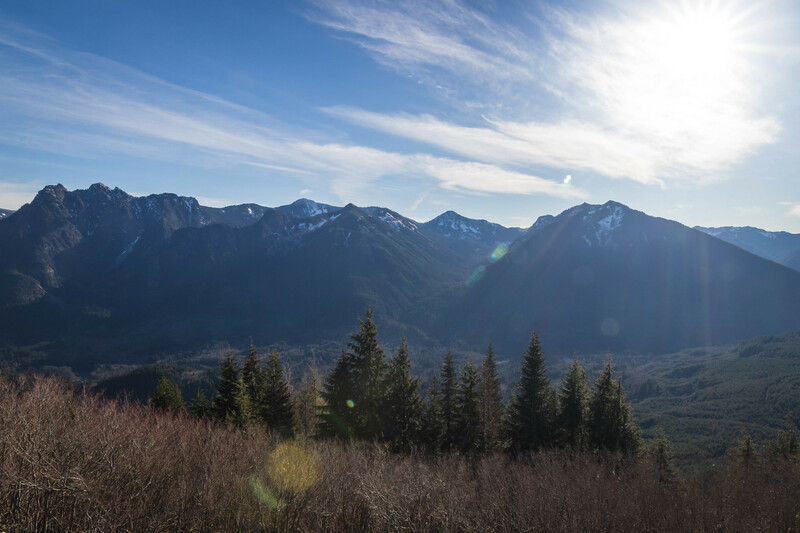 Majority of the elevation gain took place on the southeast ridge, gaining 1800′ over one-mile on the forested ridge crest. Snow patches in the lower section of the ridge were avoidable. Most snow accumulation took place in the last 600′ to the summit starting at 4,200′. I continued with just microspikes as the postholing was tolerable. Windy summit! Of all the trips taken to date, this was by far the windiest. It wasn’t terribly cold, just that the wind chill was insane! Pup and I spent most of our time west of the summit ridge on the forested slopes. I’d occasionally come up to take a photo but then got right back into the forest in between shots. By walking up and down on the summit ridge and facing east, I could get views from Mount Rainier to Mount Baker. If there were more time in the day, I’d consider heading over to the north peak and get a different perspective. On the way down, I stumbled upon a small opening in the forest and finally got a photo of Mount Teneriffe. We got back down to the promontory at sunset and then proceeded to hike the rest of the way out in the dark. Hey, I tried hiking this last weekend and failed to find a route up. I was following a path on AllTrails but we got to a rock field that just seemed insurmountable. Would you happen to have a GPX recording of your route? I’d like to try it again next week. Thanks for reaching out! If we’re talking about the same place, the rock field you came to had some flagging and cairns throughout. It’s a little steep to get up but definitely doable. That said. The link to my GPS track is at the top of this post. Good luck next weekend and stay safe! Ha! I can’t believe I missed that. Thanks a lot for sharing. I think you’re right in it being doable, but not being able to tell the depth of the snow made the risk more than I was willing to attempt. We crossed one snowfield and then gave up before the rocky area. I’m going to try again and follow your route up the ridgeline. 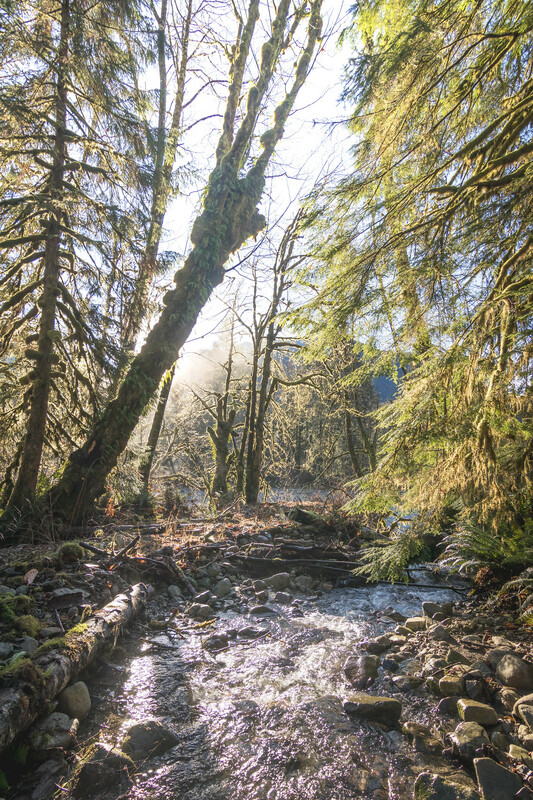 Btw, when we were starting the trail, we ran into a guy who was taking photos of the Sitka Spruce trailhead and he said he was being paid by the state to block off the trail entrance. They turned down a $1.8 million dollar proposal to build a boardwalk through the Spruce area and instead are going to block it all off and try to redirect traffic from somewhere else.